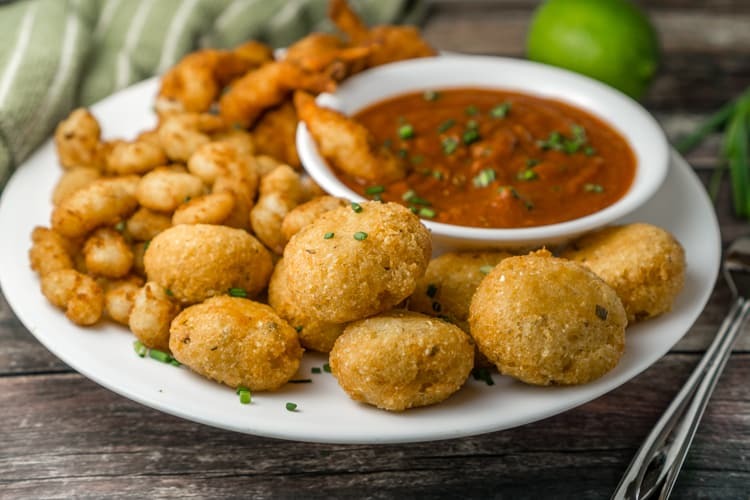 In this post I pair SeaPak® frozen shrimp products with a recipe for Cheesy Grits Fritters and a quick Cajun Marinara Sauce to make a classic New Orleans inspired dinner fit for any foodie. 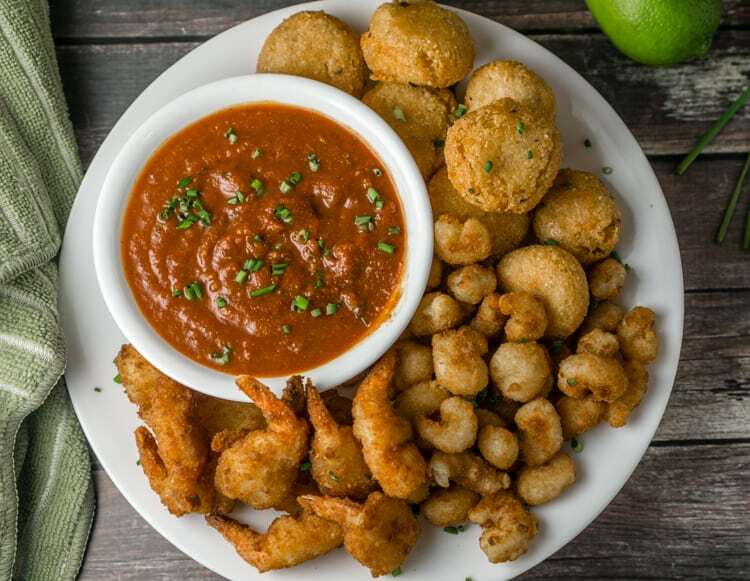 Everything is better with shrimp! It’s no secret that Aldo and I love to travel, and we are trying to go on as many adventures as possible before having kids. We try to do a variety of trips – from local road trips to Europe and Asia; from the mountains to coastal destinations. And one of the best parts about travel is eating the local cuisine. There is just so much good food in New Orleans, particularly the seafood. And even though we went out to a few really nice restaurants, one of the best meals we had in NOLA was a good ol’ southern fish fry, with a variety of fried fish and shrimp served with several dipping sauces. It was the kind of meal where you get a little messy and love every minute of it. I still salivate a little when I think about that dinner, so I decided to recreate that experience at home. 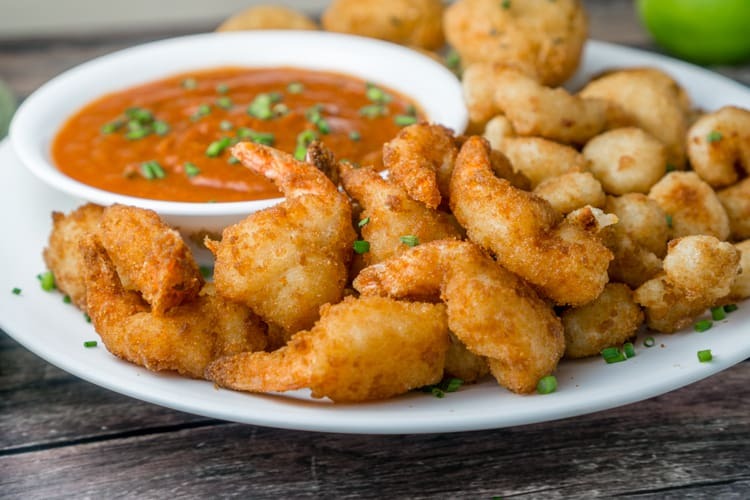 I created a recipe for Cheesy Grits Fritters and picked up some popcorn shrimp and fried shrimp in the frozen section of the grocery store to go with my fritters. Soon enough we had ourselves an amazing version of shrimp and grits, complete with juicy tender Butterfly Shrimp, bite-sized crispy Popcorn Shrimp, and cheesy, delicious grits fritters. All of this was served with a just-spicy-enough Cajun marinara sauce. This dinner totally brought us back to our trip to New Orleans, and reminded us of all the amazing food, jazz, and art that NOLA has to offer. These Cheesy Grits Fritters were super easy to make. I cooked the frozen Butterfly Shrimp and Popcorn Shrimp in the oven while frying the fritters. The perfectly crispy shrimp were ready at the same time as the freshly fried grits fritters. 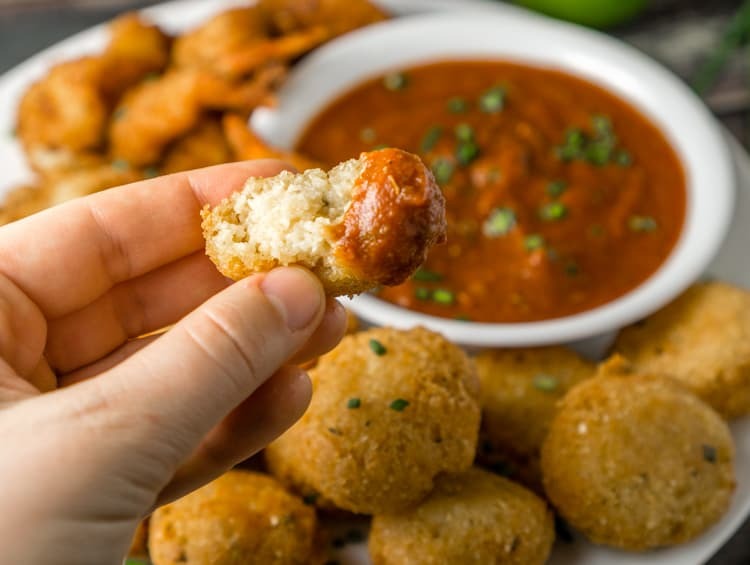 A recipe for perfectly crispy Cheesy Grits Fritters with a quick Cajun Marinara Dipping Sauce. So addictive and fun to eat! In a medium saucepan, mix together the grits, water, and 1 teaspoon Cajun spice. Cook for 5 minutes, stirring constantly. The mixture will be much thicker than typical grits that you would eat for breakfast. Stir in shredded cheese and chives and mix well. Allow to cool for about 1 hour, or until the grits are cool enough to handle with your hands. Colder grits will be easier to form into fritters, warmer grits will stick to your hands. Preheat vegetable oil for frying in a small pan or sauce pan - there should be 1-2 inches of oil. Using your hands, form the fritters: Take about 3 tablespoons of the grits mixture, roll it into a smooth ball, and flatten it slightly. Fry the fritters for 3-4 minutes, or until they are golden brown. If the oil does not cover the fritters completely, use long metal tongs to flip them carefully (so the oil does not splatter!) and fry for another 3 minutes. Fry several at a time, but do not crowd them in the pan. Remove from oil when golden brown and drain on a paper towel to absorb the extra oil. Prepare the Cajun marinara sauce by mixing together the marinara sauce, Cajun spice, lime juice, and chopped chives. 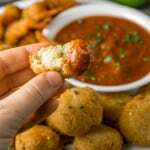 Serve the Cheesy Grits Fritters fresh with Cajun Marinara Sauce. First of all, Wow. This looks awesome! Your recipe is fantastic dear Kate, one small question though; grits is non-existent here, can we use coarse-ground cornmeal instead? Does that sound like something that could work? We use coarse cornmeal for coating calamari or shrimp sometimes, have you ever tried it?